Report in digital formADVA Optical Networking is at the forefront of providing Optical+Ethernet solutions that advance next-generation networks for data, storage, voice and video services. ADVA's innovative products have been deployed at more than 200 carriers and 10,000 enterprises around the world. With the optical transport solutions from ADVA Optical Networking provides InfoGuard a scalable and flexible product to suit all needs. In todays dynamic and yet accelerating business environment, the availability, security and integrity of data and important information becomes more and more decisive. 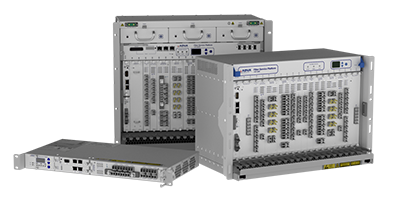 The FSP 3000 is a scalable optical transport solution designed to respond to today’s exploding bandwidth demands. Whether you’re a mid or large enterprise customer or a service provider, the modular design of the FSP 3000 ensures your networks are built on a flexible WDM foundation. Supporting up to 120 wavelengths per fiber and all common state-of-the art datacenter protocols (Ethernet, Fibre Channel, Ficon, Escon, Infiniband) with a speed up to 100 Gbps, the FSP 3000 is the right solution for your backbone and inter datacenter connectivity. In addition, the certification with all major storage vendors guarantees full interoperability within your network. ADVA's network encryption solution integrated into the FSP 3000 is optimized for data center interconnection applications requiring maximum data security on the network connecting your locations. It provides a transparent wire-speed service using the internationally recognized Advanced Encryption Standards (AES) algorithm for securing private information. Dynamic key exchange and a strictly separated encryption domain manager make our solution compliant to the most stringent regulatory requirements. Our flexible 10G and 100G muxponder module implementation lets you carry a wide variety of protocols including Ethernet, Fibre Channel, and InfiniBand. The hardware-based network encryption implementation delivers maximum efficiency at ultra-low latency to address mission-critical applications. The innovative network encryption technology from ADVA Optical Networking, enables customers to transport their data securely with ultra-low latency across high performance point-to-point network environments. Read more about the new Layer 1 Ethernet Encryptor - ConnectGuard! Long-term cooperation with ADVA and a broad customer base. InfoGuard is the only ADVA Elite Partner in Switzerland with certified ADVA Engineers. Successfully implemented projects thanks to long-term project and support experience as well as the regular cooperation with the ADVA team. IT security is a mandatory element on the agenda of every CEO. Why - and how the security in your company increase - learn more in our blog!